You pretend to cook meat and I’ll pretend to pay. Photo courtesy of Yici Lee. Mock turtle soup could certainly look like that. I thought I had brass in pocket but it turned out to be tin foil. Which pot is Trump in? @DnT 0455. Yup! It’s Mock Turtle soup. Beautiful soup – beautiful soup. Anyhow. Whatever it is it looks pretty bloody delicious. My guess = Mulligan Stew. Kongkong (Tokpisin) word for Asian – mainly referring to Chinese. Maybe it is all an illusion. Buddha may only be pretending to jump the wall. Hmmmm! I would estimate his flying speed, and stall speed, to be identical. Traditionally, this Fujian dish from the Qing Dynasty comprises up to 30 ingredients, including chicken, ham, taro, mushrooms and shark’s fin. Our recipe features more accessible ingredients, while maintaining a high-protein hotpot. The origins of this dish’s name are debatable. 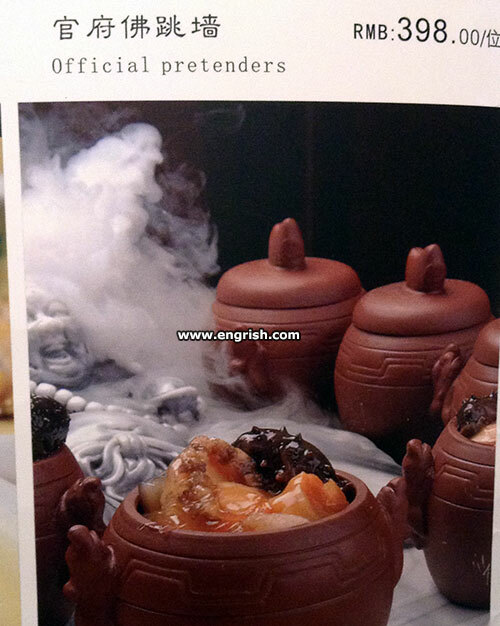 One story describes how the meal’s rich aroma could tempt even Buddha to stop meditating and jump over a wall to find it. Where there is a wanton, there is a huawei. I think I’ll stay with the stew of trash…same sh*t and a lot cheaper as well. The steam is the most nutritious part of the meal. @DrLex | 8:19 am: I’m confused: is there an “unofficial” Buddha? Yes indeed! It’s Chris Handy. (Ex Rugby Union Front rower – international) His nickname was Buddha, because the physiques were identical. BTW. He couldn’t fly autonomously either. This seems to be the new wave of cuisine. The other official Pretenders would even sing its praise. Fine. I shall pretend to be a customer. Now we know what really happened to James Honeyman-Scott and Pete Farndon.